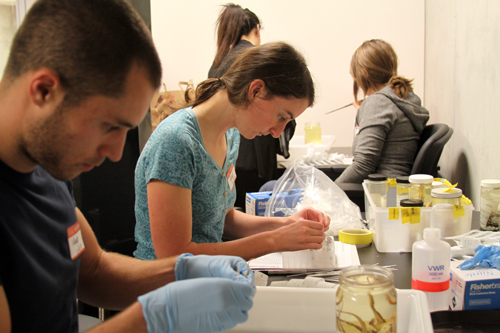 The Race: Why We Collect Specimens! Summer has been extremely busy. Our irrepressible bryologist, Jim Shevock, comes into my lab almost weekly with new moss discoveries from GG VI. He says a new paper on Fissidens (the largest moss genus on Sâo Tomé and Príncipe) is almost finished and will be submitted for publication as soon as he and his colleagues (from the US, the Netherlands and Lisbon) complete a key to identification of the species. Recall that Jim nearly doubled the number of collections he made during GG IV… He thought he had seen everything! The mesa on Príncipe will be a primary target for our botanists on GG VII, next year (see below). A nice surprise from GG VI was that we finally got some nice, un-posed photographs of the Sâo Tomé puddle frog, Phrynobatrachus leveleve. Readers may recall that we described this new endemic species back in 2007 following GG II (leve leve means “take it easy” in the local language). Obviously the way to get good shots of these critters is at night! 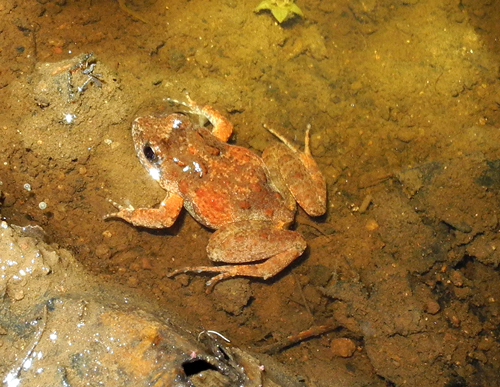 Another good find on a different night was Newton’s rocket frog (Ptychadena newtoni) at a new locality, Caxueira. In earlier days I was concerned that this species, endemic to Sâo Tomé, was on the wane due to human development, but it appears to be more widely distributed than we thought (see also Feb 2011 blog). Caxueira is not far from the city center. Why do we collect plant and animal specimens? Why do we bring them home euthanized and preserved (or in the case of plants, pressed and dried), and why do we organize and store them for posterity? The easy answer is that we need to find out what they are, to identify them and describe them so we can communicate about them. We certainly cannot conserve or preserve or even talk about species if we do not know they exist. This is particularly important in the tropics where so many different species have evolved, and especially in areas like Sâo Tomé and Príncipe that have never been fully explored by biologists. An added note is that for a biologist to know that a species is new and undescribed, he has to know all the related species that it isn’t and then demonstrate it! It is a fact that a lot of things in the tropics that look alike are not at all related; conversely, some critters that look radically different are, in fact, just variants of the same species. The botanists of course confront similar questions. Below are two species of the genus Impatiens. Both species are high elevation forms described a long time ago: I. manteroana is thought to be endemic to Príncipe, while I. thomensis is known only from Sâo Tomé. But are they really different species? And if so, are they each other’s closest relatives? We do not yet have material of the former, but this is a question we can answer next year through DNA analysis. The specimen on the right was photographed high on the Príncipe mesa, which is one of the reasons it is a target area for next year. 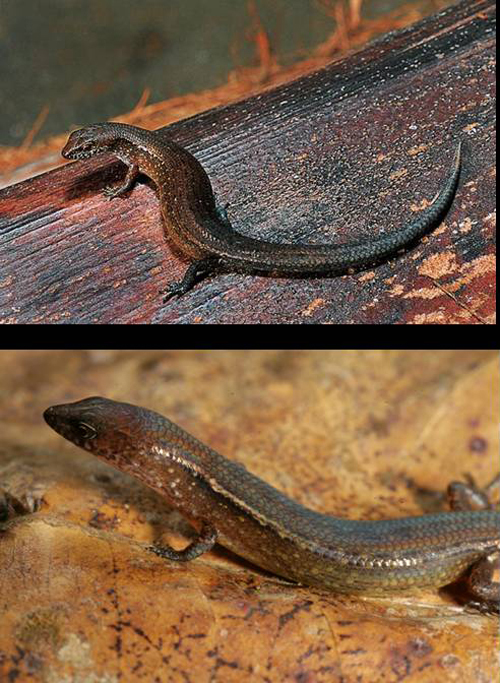 These are photographs of small leaf-litter skinks of the genus Afroablepharus. The specimen above was collected on Sâo Tomé during GG I and the one below came from Príncipe (GG II). While they look identical, they are actually two different species as shown by colleagues of ours who were working on the molecular level: extracting DNA from small bits of tissue (probably tail tips) the two species were shown to be genetically quite different. 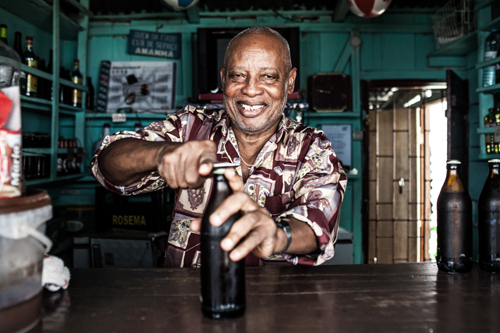 The one from Príncipe was described over 160 years ago (A. africanus), while the one above, from Sâo Tomé, remains unnamed. This is most frustrating as even though we know they are separate species, we cannot describe the new species yet because the Sâo Tomé animals from which the DNA was analyzed were not collected. It is a complicated situation that both groups of workers together are trying to resolve at this time. Another example can be found in the island geckos about which I have written before. From public presentation by E Miller. CAS Big Kahuna phot (same specimens from above and below). For over one hundred years, the geckos from both islands that lack thumb nails were considered to be the same species, Hemidactylus greeffi, originally described from Sao Tome. Our same colleagues noted that the two were genetically different but again failed to take whole samples and so could not describe the Príncipe species as new. It was not until we closely examined specimens in our Academy collections from both islands that we found many morphological differences between the two, which strongly supported the genetic evidence of our colleagues. The animal on the right is now known as Hemidactylus principensis, yet another island endemic. As luck would have it, the paper was published while we were on Principe! The smaller specimen on the right in both views is also what is known as the holotype; i.e., it is the single animal that is described in minute detail that becomes the “name bearer”. All geckos collected from the islands and identified as H. principensis will be based on the description of this particular specimen; holotypes are the most important specimens in any collection. In our collection, which is probably the fifth largest in the world, all holotypes are housed separately and identified by a blue ribbon. 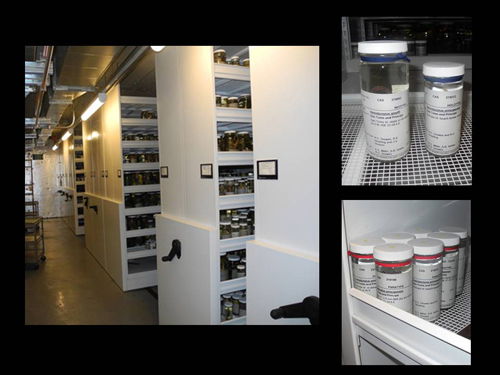 Part of Herpetology collections rooms; holotypes above right, paratypes below right. RCD phots. Another question often asked of museum scientists is “why do you have to collect so many?” The answer is that species vary; no two members of the same vertebrate species are identical. This is why we include additional specimens in a species description. While the holotype or “name bearer” is usually a single animal in a standard description, other members of the same purported species, hopefully from the same place, are also described in some detail in order to account for individual variation. These are usually designated as paratypes; in the Academy collections, they are always designated by red ribbons [above] and are the second-most important. Yet another frequently asked question is, “do you have to kill the specimens?” The answer lies in the fact that not all characters (similarities and differences) are observable from the outside. With animal groups like frogs, one has to look deeper, and this is impossible with living specimens. Below is a collage of some of the sorts of characters I had to examine in determining the relationships between members of African tree frogs of the family Hyperoliidae— found in Africa, the Seychelles and Madagascar. 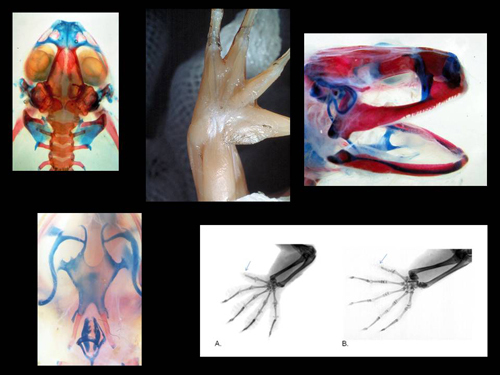 Notice that the x-ray in the lower right hand corner revealed to us that the two geckos mentioned above not only lack thumb nails, they lack the entire terminal bone of the thumb! 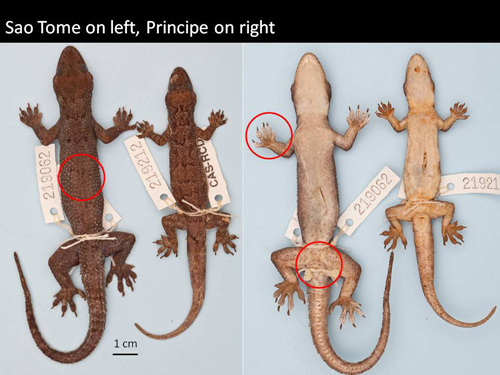 (the new species, Hemidactylus principensis, is on the left). So far as we know, they are the only two members of the genus Hemidactylus, (90+ species) that exhibit this characteristic. This might suggest they are each other’s closest relatives, but we are in the process of determining that by further DNA analysis that includes other closely related species. 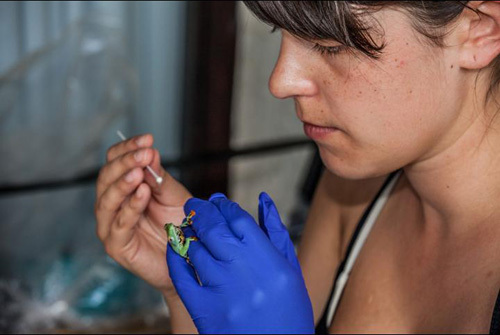 Notice that in her left hand, Rayna Bell is holding an adult Sao Tome giant treefrog (Hyperolius thomensis), while in her right she has a cotton swab. She swabbed the skin of each frog she collected a number of times in a number of places in order to detect the presence of chytrid fungus. The swab will also detect the actual infection load if the fungus is present. This is the first attempt at detecting the fungus on the islands of Sâo Tomé and Príncipe, and we do not yet have results. It is certainly present in other areas of Africa. 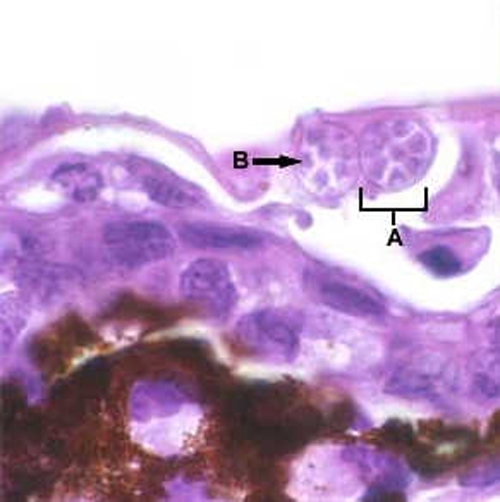 Batrachochytridium dendrobatidis (Bd for short) is a fungus that has been implicated in the mass die-off of populations of frogs in many parts of the world. 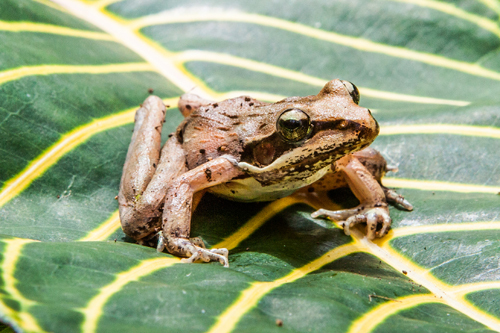 Frog skin is a living membrane through which gasses and water can freely pass; while the mechanism is not well-known, the fungus seems to totally disrupt these functions causing the demise of the infected frog. Another real value to collections is the fact that past history can be discovered through our specimens. It turns out that Bd can also be detected by swabbing alcohol preserved specimens regardless of age, although the resulting data are not quite so informative as samples from living material. 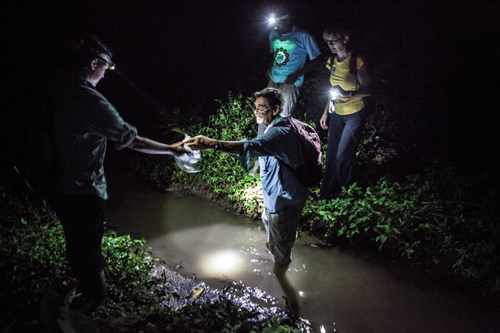 Below is Dr. Dave Blackburn’s “chytrid crew” (mostly undergrad and graduate students) swabbing specimens collected from the Impenetrable Forest of Uganda many years ago. Dave is our new curator in herpetology and a real expert on Bd. Dave Blackburn’s “chytrid crew”. D. Blackburn phot. Every trip to these small amazing islands yields new discoveries. We are planning our next expedition for 2013 and excited at the prospect of the new stuff we will find. Author islandbiodiversityracePosted on August 22, 2012 Categories Afroablepharus, Biodiversity, biogeography, chytrid fungus, DNA, flowers, frogs, geckos, Gulf of Guinea, Hemidactylus, Impatiens, Island endemics, island people, lizards, principe, Ptychadena, Sao Tome1 Comment on The Race: Why We Collect Specimens!